Tag line: "By night they leave their graves, crawling, shambling, through empty streets, whimpering, pleading, begging for his blood!" 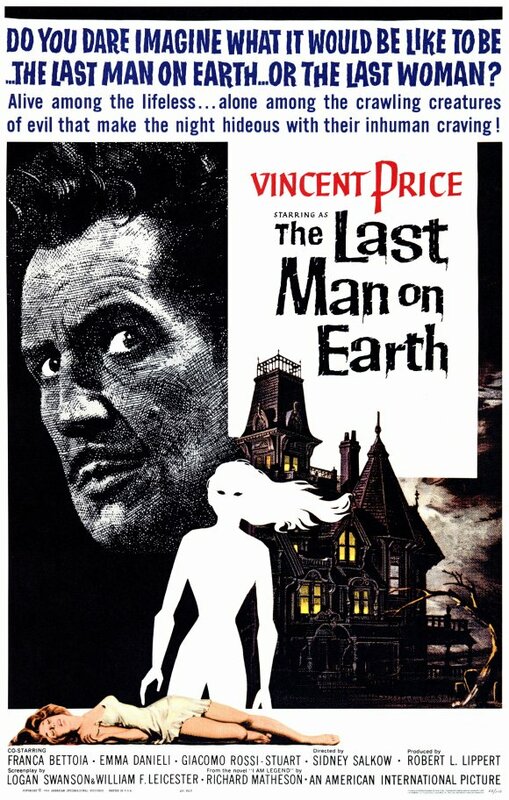 The Last Man on Earth was the first film adaptation of Richard Matheson’s I Am Legend, a 1954 novel that would later serve as the source material for 1971’s The Omega Man, starring Charlton Heston, and 2007’s I Am Legend with Will Smith. And while there are aspects of this initial telling that work, The Last Man on Earth, as a whole, is only moderately successful. 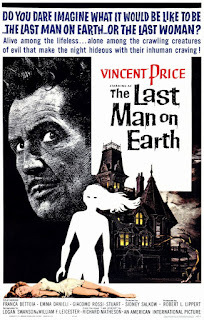 Having survived a worldwide plague that killed millions, research scientist Robert Morgan (Vincent Price) now believes he’s the last normal human being on earth, primarily because all the other so-called “survivors” have been transformed into vampiric night dwellers. Morgan spends a large portion of his days hunting these remnants of humanity, killing any he happens to come across by driving a stake through their heart. But once the sun goes down, Morgan must lock himself away in his house, using garlic and mirrors to fend off the vampires who gather outside. It’s a lonely existence, one that occasionally drives Morgan to the point of despair, yet as he will soon discover, he might not be as alone as he thinks. The Last Man on Earth starts well enough, with some eerie establishing shots of dead bodies lining the streets, and a church sign that reads “The End has come”. Several later scenes are also strong, especially a flashback in which Morgan recalls the afternoon he came home to find his daughter, Kathy (Christi Courtland) had died of the plague, and her body was already on its way to a mass grave. We feel his pain as he chases after the truck that's carrying her remains, screaming once it reaches its destination that he wants his daughter back. “A lot of daughters are in there”, the driver tells him, “including my own”. I even enjoyed the voice-over narration, which, in a movie about the last man alive, is almost a requirement. Unfortunately, one of the key problems with The Last Man on Earth is its casting. I’m a Vincent Price fan, but being in his early 50s at the time this movie was made, he was far too old to be playing Morgan, which, at times, is a physically demanding role. Early in the film, Price appears to be handling things well, lifting a dead body and throwing it into the trunk of his car with the greatest of ease. But then, much later, he spots what he believes to be a woman out walking (during the day, no less) and tries to catch up with her. Alas, the legendary actor never gathers up a good head of steam in his pursuit, and the ensuing chase is really kinda sad. Even with the poor casting of its lead, The Last Man on Earth is not a bad movie. But if you’re sitting down to watch it simply because you’re a Vincent Price fan, you’ll probably walk away disappointed. Matheson's script for the Hammer version would have been quite different to that which featured Vincent Print, more gory for a start (one reason why it never got made). So far as I know, it still languishes on some dusty shelf in the studio vaults. I read the novel before I saw this film. And I was surprised by the relatively faithful adaptation of Matheson's book. A much more accurate portrayal of the novel than either "The Omega Man" or the much later "I am Legend" with Will Smith. I still think the most effective movie to feature the themes and ideas from Matheson's novel is the original "Night of the Living Dead" by Romero and his co-writer John Russo (who often gets overlooked when the subject of NOTLD comes up).